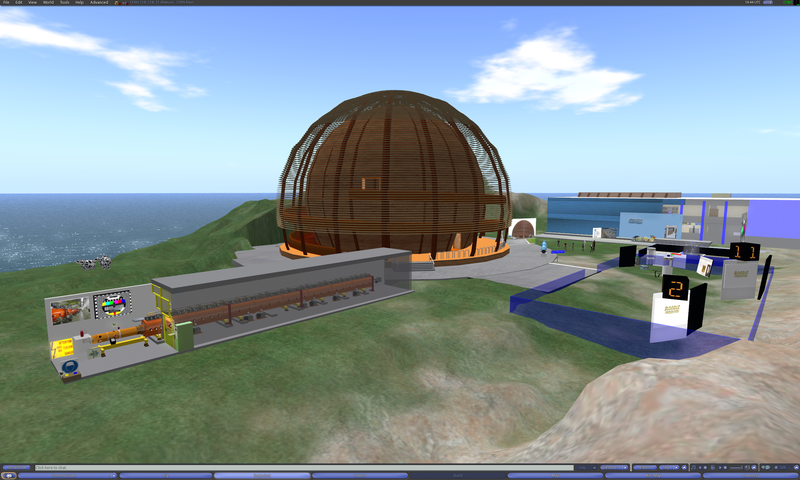 For today’s meeting, we explored the region CERN on New World Grid. 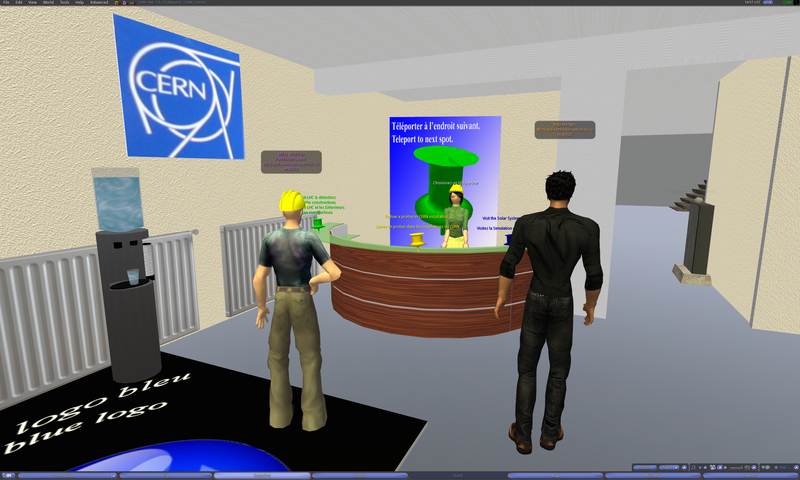 In real life, CERN (the European Organization for Nuclear Research) is one of the world’s largest and most respected centres for scientific research. The instruments used at CERN are particle accelerators and detectors. Accelerators boost beams of particles to high energies before they are made to collide with each other or with stationary targets. Detectors observe and record the results of these collisions. 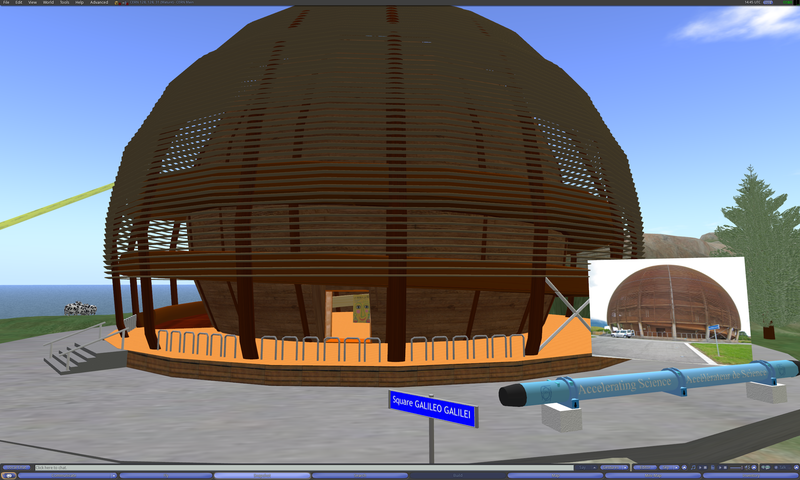 The region CERN on New World Grid features detailed recreations of real life architecture at CERN as well self-guided tours of models of particle accelerators. Pathfinder Lester: I’m Pathfinder Lester, John Lester in real life. I used to work at Linden Lab from 2005-2010. Now I work at ReactionGrid Inc. as Director of Community Development. 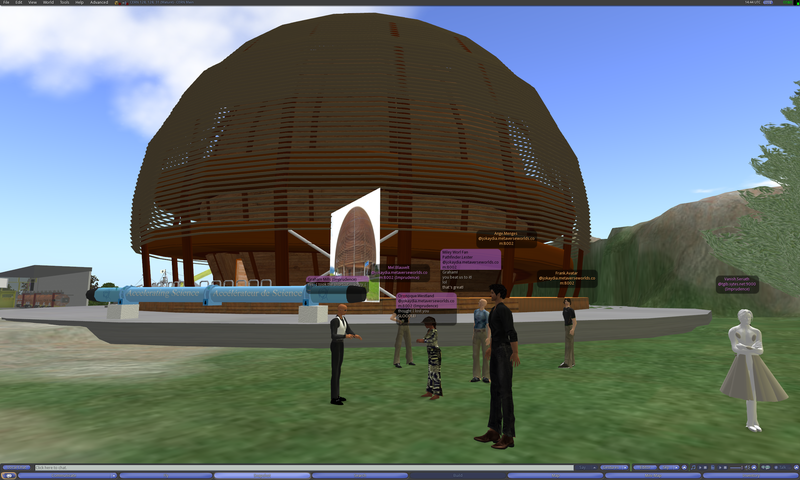 Pathfinder Lester: many of us are still very interested in virtual worlds. Pathfinder Lester: mel, oh that’s very cool! Vanish Seriath: I guess sudo get-me-a-beer worked. 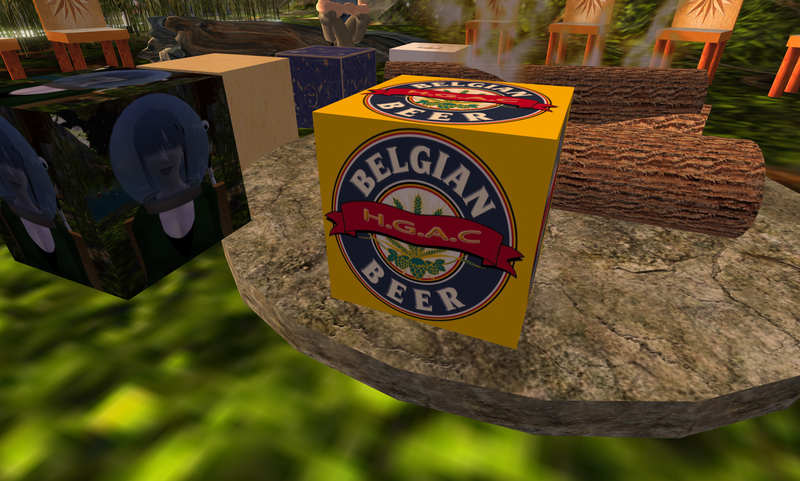 Pathfinder Lester: belgian beer! thank you Ange! Vanish Seriath: Aw, I just got El hooked on them. 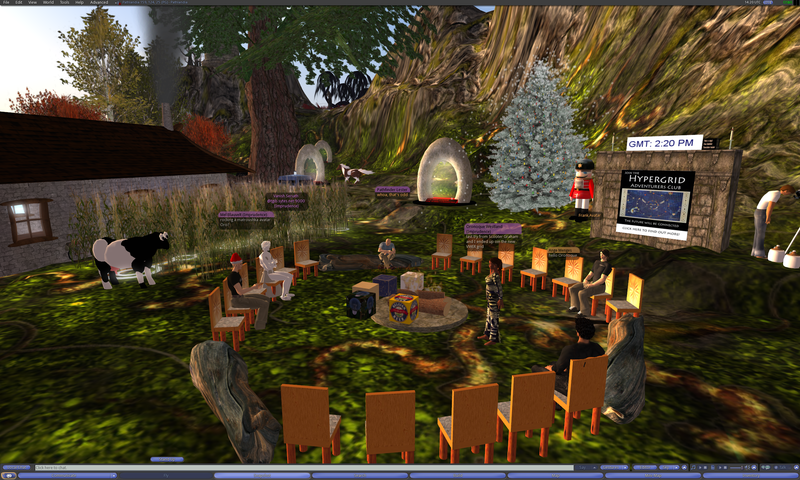 Pathfinder Lester: i try to leave small scenes around Pathlandia for people to discover. Vanish Seriath: Yes, every time I’m here there’s something new. Pathfinder Lester: also, I’m going to post my blog report on our tour of “The Grey Inn Between” today. lots of pics, too. Vanish Seriath: Hah, I found Matthew. Oronoque Westland: is it really me? Mel Blauvelt: rocking a matroushka avatar Oro? Pathfinder Lester: Oro, if you have a chance, could you submit a short ticket about that on http://metaverseheroes.com? Pathfinder Lester: Chris at ReactionGrid is trying to iron out that bug, and she’s tracking everyone who experieneces it on metaverseheroes. Pathfinder Lester: Frank, do you do much hypergrid jumping between the different grids? Pathfinder Lester: nice! so you’ve seen things come a long way, i expect. 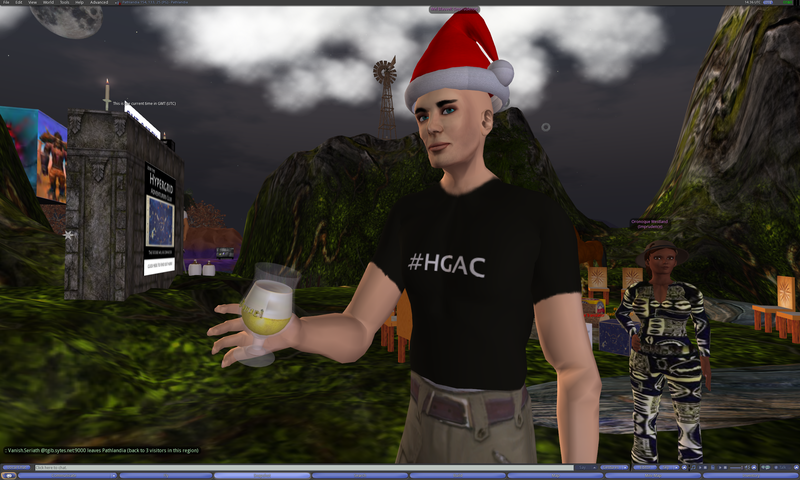 Pathfinder Lester: what are your thoughts on the current fragmented state of the hypergrid? I know many of us are hoping that gets resolved soon so we can jump all over freely. Vanish Seriath: Oh nice, where is that, Frank. 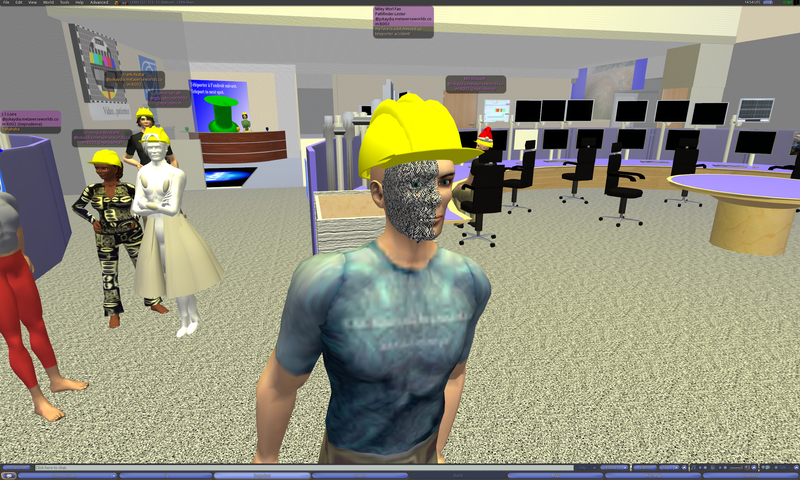 Pathfinder Lester: Frank, what about the current bug that is preventing folks from OSGrid from hypergrid jumping out of OSGrid? do you know any news about that? Oronoque Westland: phone woke me—I said, if its not Path hang up! 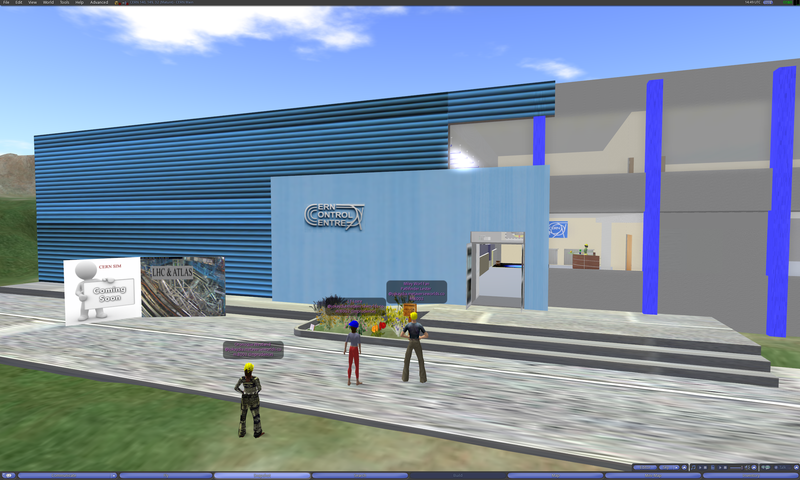 Pathfinder Lester: well, it must make you happy to be seeing all the different opensim grids growing these days. so much growth in a short time. 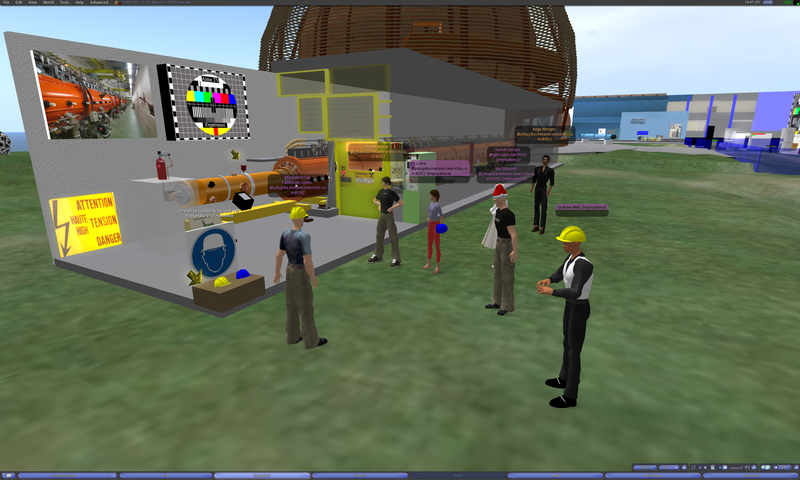 Ange Menges: So at the moment, the only way to come in osgrid is to create an av on osgrid ? Pathfinder Lester: Ange, I believe yes. Frank Avatar: I think so also.. Vanish Seriath: Well me too. And I build a lot more things than I ever did in SL. Pathfinder Lester: V, i hear that sometimes too. you don’t often run across large groups of people. but i know many different projects are going on with folks building things. Vanish Seriath: Well, when I joined SL, it was basically the same there. Pathfinder Lester: V, good point. Vanish Seriath: You could walk for hours without meeting a living soul. 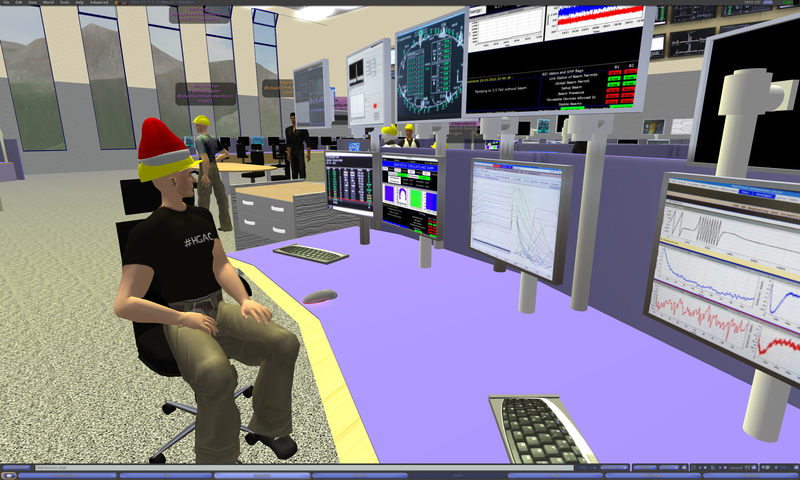 Pathfinder Lester: it’s still the early pioneering days in opensim, i think. you can wander for hours and not see people. yet you find places where people are actively building many interesting things from scratch. Vanish Seriath: Yes, and we organize differently. 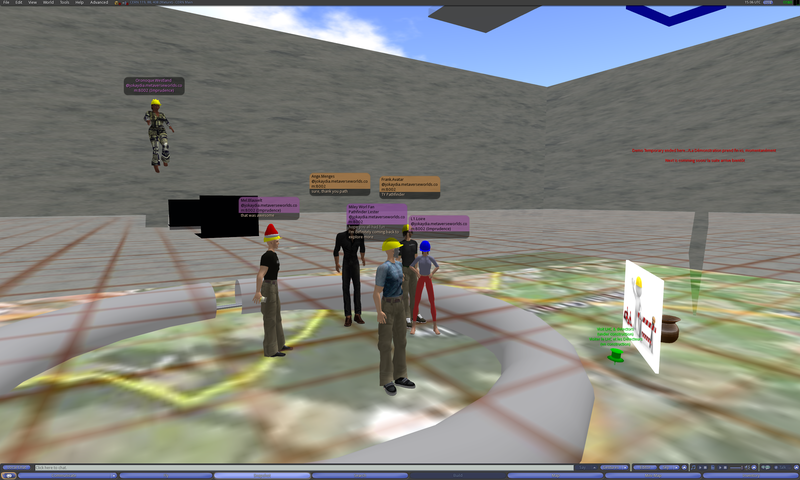 Vanish Seriath: When you follow twitter or IRC, you can always meet people inworld. Pathfinder Lester: Ange, oh cool. ty. Pathfinder Lester: speaking of finding interesting projects, for today’s tour we’re going to visit a place I discovered in my wandering around NewWorldGrid. 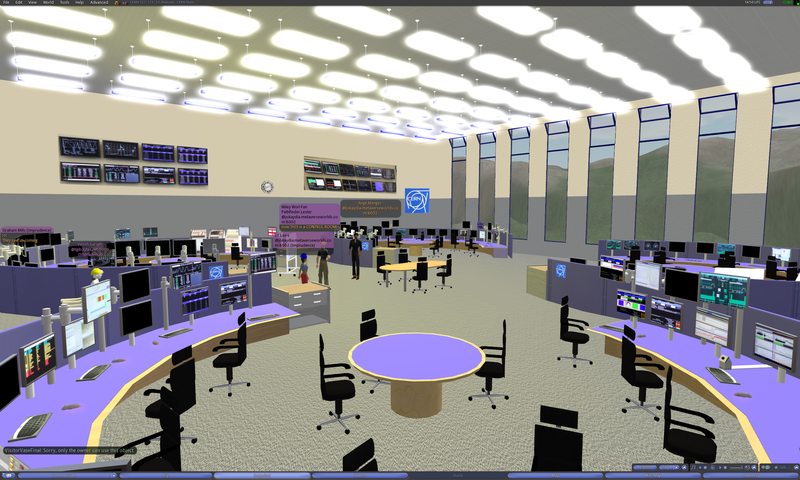 From here we’ll make a local teleport on New World Grid to the region “CERN.” CERN (http://public.web.cern.ch), the European Organization for Nuclear Research, is one of the world’s largest and most respected centres for scientific research. The instruments used at CERN are particle accelerators and detectors. 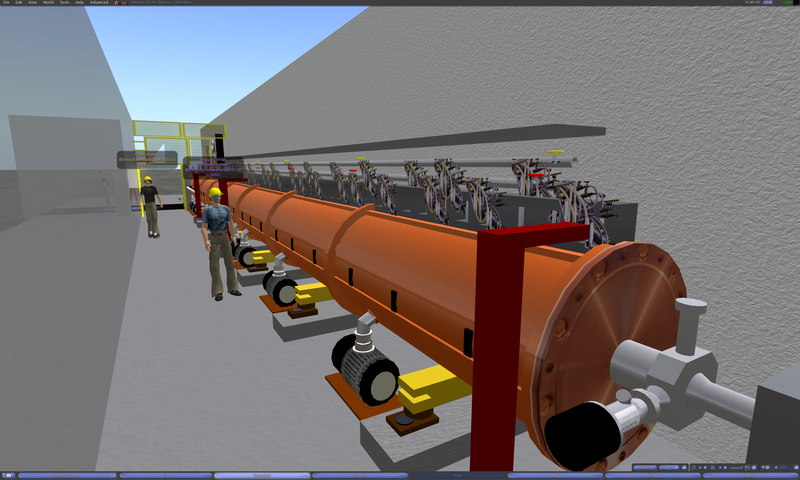 Accelerators boost beams of particles to high energies before they are made to collide with each other or with stationary targets. Detectors observe and record the results of these collisions. 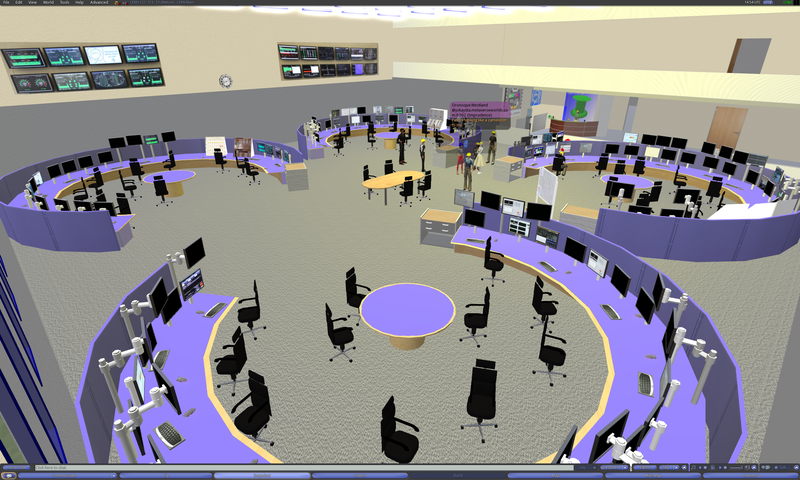 This region features some detailed recreations of real life buildings at CERN as well as models of particle accelerators. Pathfinder Lester: Ange, that’s wonderful. Thank you ! Pathfinder Lester: Oro, what’s that? Pathfinder Lester: Oro, ah yes! that’s another way to do jumps. Pathfinder Lester: but sometimes I find that it does not always work. Oronoque Westland: does anything ALWAYS work heehee? Pathfinder Lester: that’s why i usually recommend folks do the Manual jump. 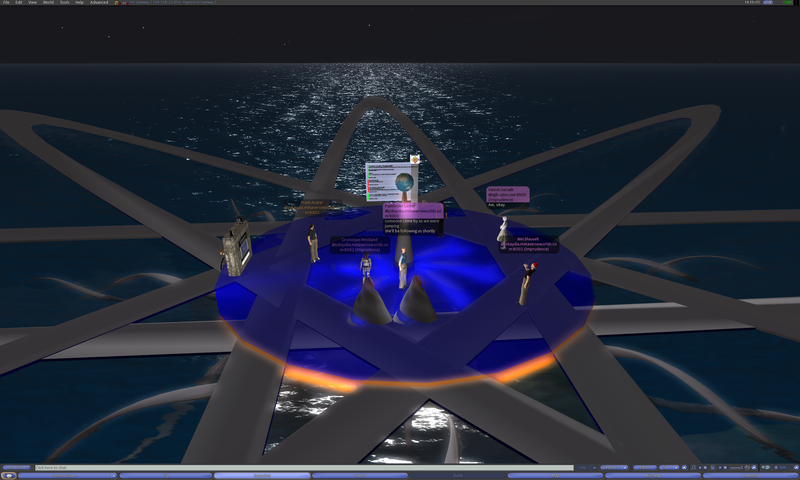 Pathfinder Lester: perhaps we can try using SLURL hypergrid jumps at our next meeting. Pathfinder Lester: for today’s tour, our first jump will be an instant hypergate one. Pathfinder Lester: then a manual jump to NewWorldGrid. Pathfinder Lester: Ange, oh cool. i’ll look for it. ty! Our group walks through an Instant Hypergate (aka a “Blamgate”) on the region Pathlandia on jokaydiaGRID. 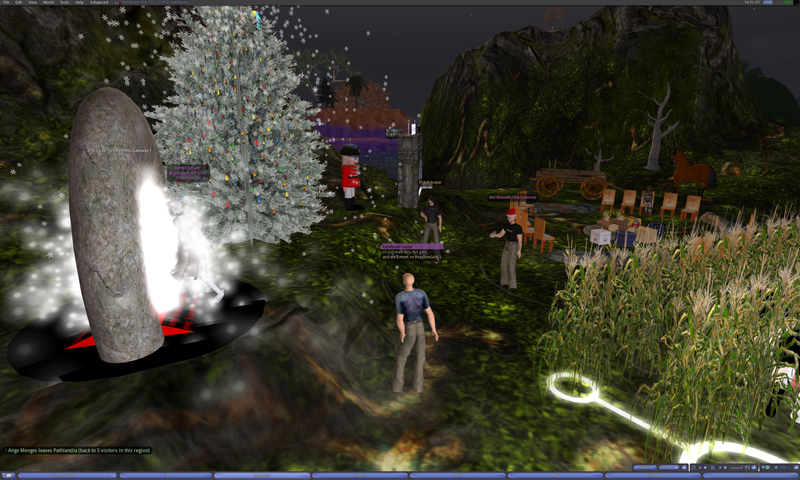 We all make a Manual Hypergrid Jump to the region Laasonen on New World Grid. Pathfinder Lester: i couldn’t find the hypergrid address of it, so we have to make a hop from here. Pathfinder Lester: yes, looks good for meetings too! Pathfinder Lester: ok, see you on CERN! We all make a regular local teleport within New World Grid to the region CERN. Pathfinder Lester: you beat us to it! 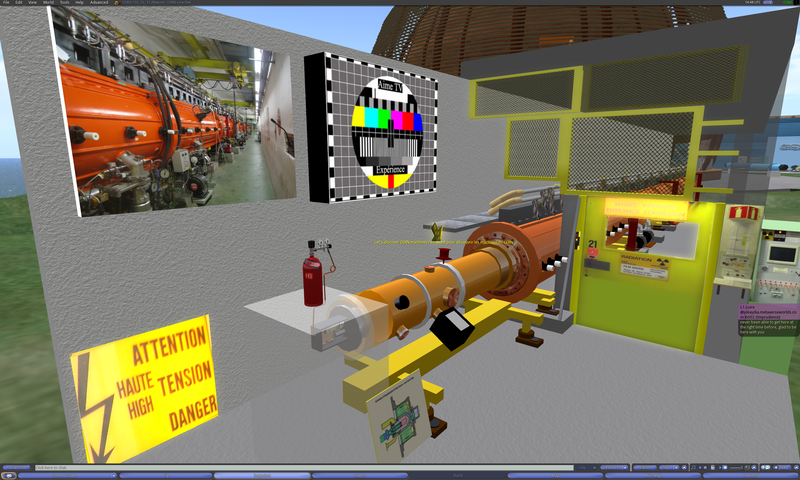 Pathfinder Lester: so, this area is being developed by someone who works at CERN in real life. Pathfinder Lester: and that big dome is a real life buildling at CERN, too. Vanish Seriath: Is it finished? Vanish Seriath: Looks a bit empty inside. Pathfinder Lester: free hardhats over here! Pathfinder Lester: L1! you made it! Pathfinder Lester: i like how they have a pic of the real life accellerator next to the model here. Vanish Seriath: Yes, it’s great to compare the model with the pictures. Pathfinder Lester: the other place I wanted to show folks is the Control Center. 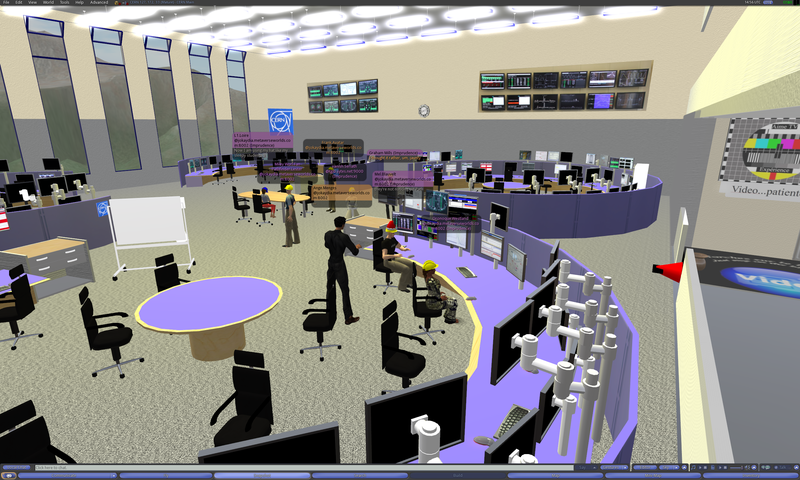 a model of the real life control center at CERN. Pathfinder Lester: go inside, but DON’T PUSH BUTTONS. you might explode the accellerator! Pathfinder Lester: now THIS is a CONTROL ROOM! Oronoque Westland: is anyone seeing the videos? Vanish Seriath: Heh, I’d love to have all these screens. Vanish Seriath: Would make following things easier. Pathfinder Lester: i don’t thing video works well with Imprudence yet. Pathfinder Lester: Oro, yes, this is a good example of modelling RL architecture and office layout. Vanish Seriath: It’s really nice. Pathfinder Lester: Mel, i see you sitting there in front of a workstation. fire up the beam! Pathfinder Lester: discover a new particle! Pathfinder Lester: should we try visiting some of the spots at the help desk? Pathfinder Lester: very nice self-guided tour! Pathfinder Lester: Ange, stay positive! L1 Loire: thanks, Path, glad to see you and to have finally made it to the club! Pathfinder Lester: great to have met you Frank. Pathfinder Lester: and L1, so great you could make it. been too long since i’ve seen you last. Vanish Seriath: Yes, it’s been great, as usual. Pathfinder Lester: have a great rest of the day, everyone. and keep those hardhats handy! Mel Blauvelt: thanks Path, see you soon all! Pathfinder Lester: take care, my friends. This entry was posted in Education, Hypergrid Adventurers Club, OpenSim and tagged avatars, CERN, education, HyperGate, HyperGrid, Hypergrid Adventurers Club, jokaydiagrid, metaverse, new world grid, online communities, OpenSim, physics, pioneers, ReactionGrid, virtual worlds by John "Pathfinder" Lester. Bookmark the permalink.